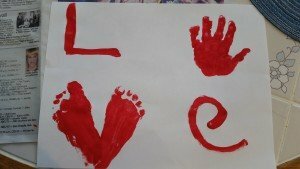 This cute Valentine’s Day handprint/footprint craft is a perfect keepsake for your baby’s first Valentine’s Day. It’s also a great craft to do for your toddler. After I finished mine I placed in a frame on my wall. Another idea is to have it lamiated and use it as a placemat. You can get things laminated at most teacher supply stores. Not only is this craft great for Valentine’s Day, but it’s also a great idea for a mother’s day gift. Follow the step by step directions below to make your own keepsake. Step 1: Paint your child’s hand with red paint. Make sure you don’t use too much paint. Stamp thier hand on the top right portion of the paper. Clean their hand with a baby wipe before they touch anything, then use soap and water. Step 2: Paint their left foot with the red paint. Stamp thier foot on the bottom left side portion of the paper. Make sure you stamp it on an angle. This will be one side of the V. Clean foot with baby wipes and then soap and water. Repeat this step with the other foot. Step 3: Using the red paint write the letter L in print or script on the top left portion of the paper. Step 4: Using the red paint write the letter E in print or script of the bottom right portion of the paper.